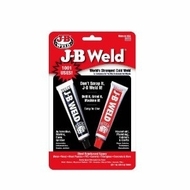 J-B Weld is a remarkably easy, convenient and inexpensive alternative to welding, soldering and brazing. J-B Weld will bond to virtually any clean, dry surface including: iron, steel, copper, aluminum, brass, bronze, pewter, porcelain, ceramic, marble, glass, concrete, fiberglass, wood, some plastics, and many more. Before it sets, you can clean up with soap and water.